Iwas born on February 24, 1924 in Ijebu-Imosan. My father was a farmer and my mother was a petty trader. They weren’t rich and at the same time poor. We were comfortable by standard of that time. My parents were both Christians and this had a great influence on us (the children). My mother was a member of Christ Apostolic Church (CAC) Ijebu-Ode and while I was schooling at Ijebu-Ode, she would always want me to attend programmes for prayers. So, I had a Christian upbringing. I enjoyed life with my five siblings comprising of four boys and a girl. And growing up in Imosan at that time was fun. It was a primitive setting. I moved with my age group and when I started school at St. Peters Anglican Primary School where I read up to Standard Two, I still moved with the same set of peers. There was no electricity and no pipe borne water. 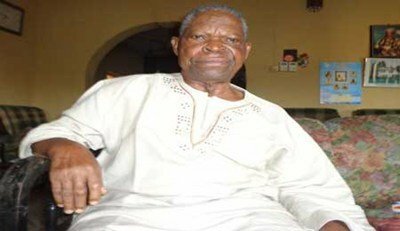 In fact, I was a pupil -teacher when I went to Lagos for the in 1941. My first time in Ibadan the capital of the then Western Region was when I went with my Uncle, Mr. Odugbote who was teaching at the Ibadan Grammar School to Ibadan. It was a joyful moment for me and was happy to see life beyond the confine of my home town. I didn’t wear shoes while I was growing up but was privileged to have access to a pair of shoes towards the end of primary school when I became a member of Boys Scout at Christ Church School, porogun, Ijebu-Ode. As said earlier, some of my siblings were boys and the only girl among us died in 1943. So, I was engaged in house chores. I remember when I was in primary school, I was involved in farming. I would go to school in the morning and went to join my father in the farm in the afternoon. And for the house chores, I fetched water and firewood, washed plate and cooking pots. And when I went to live with my uncle at Iperu-Remo I did everything in the house including cooking. That was how we maintained life. I began primary education at age six in 1930 at St. Peters Anglican School, Imosan. The structure was built after I had left the school. So, we were using the bench from the church. After church service on Sunday, we would arrange the bench to make room for our classes during the week. And at the closing of school every Friday, we would arrange the bench back for Sunday service. I had only elementary school at St. Peters Anglican School. In 1934, I moved to St. Matthews Primary School, Imodi where I began in Standard Two. The school had a building and the headmaster was one Mr. Adeyemi. The school was reading up to Standard Four. And when I got there, the standard was a bit lower than where I came from and I couldn’t cope. And at the end of the year, I was asked to repeat Standard Three and others were asked to repeat Standard Two. In 1936, my uncle who was an headmaster of St. James Anglican School, Iperu-Remo where I completed Standard Three and Four left for Ibadan in 1938 and I moved with him. He enrolled me at Seventh Day Adventist. His wife was not living with him while we were at Ijebu-Remo but joined him when he moved to Ibadan. It was a big challenge for me because I was pre-occupied with house chores most of the time and didn’t have time for studies. I was a brilliant kid because when I took an entrance examination to that school, I came first. But I couldn’t keep the standard because I was always coming late to class. I didn’t have the school uniform as well and I was sent out of the school, which was partly my fault because I didn’t tell him on time. That was how my stay in Ibadan was short-lived. My uncle sent me back to Ijebu out of annoyance in 1938. Leaving Ibadan wasn’t the end of my academic career. My parents took me back to continue school at Christ Church School, Porogun, Ijebu-Ode where I read Standard Five and Six finishing in 1939. I couldn’t proceed to secondary school because of money. That was how I began a career as a pupil- teacher in the Christ Church School, Isiwo where I spent two years. In 1941, I moved to Baptist School, Agbowa where I taught for a year and nine months. I wasn’t satisfied with just standard six because I saw it as a sign of limitation. I applied to the Baptist Teachers Training College, Iwo (Osun State) in the then Western Region. The school has been converted to Bowen University now. I was lucky I had scholarships throughout my three years in that school. After three years, I was posted to a private school where I spent only two years before moving my teaching services to African Church School, Ilaro which is in the Egbado Division then. I was in this school between 51 and 54 as headmaster. The school was doing up to Standard Four then because it was very difficult to get approval for Standard Six in those days. I worked very hard as headmaster of this school and we were able to come out with good results. I was able to get approval for Standard Six. Having acquired a Grade 11 certificate that upgraded my teaching career to an extent, there was this hunger in me that I didn’t belong. Again, I wasn’t satisfied being a pupil-teacher and headmaster alone. That pushed me to long for more knowledge. In 1954, I went to Nigerian College of Arts, Science and Technology in Ibadan at age 30. In this school, I was admitted for an advanced teacher’s course without knowing that we were to sit for General Certificate in Education (GCE). When I got there, I was asked to choose three subjects that I would sit for in GCE. So I picked Mathematics, Applied Mathematics and Geography. I failed Geography and couldn’t cross over to the University of Ibadan as I had hoped to do. It was Epe Division Grammar Nine School that sponsored me to attend this school. After finishing my advanced studies in Ibadan I had to go back to Epe Division to fulfill my bond. I finished my bond in 1959 and I left. In 1960, University of Nigeria, Nsukka was about starting and they advertised. I was 36 years but I was unperturbed because I had set goals that I must accomplish. With my little qualifications, I applied and surprisingly I was offered admission to study Mathematics. So I was a pioneer student of UNN at age 36 in 1960. It was the happiest moment of my life when I became an under-graduate of a newly established University of Nigerian in 1960. My ambition was to study for a degree in Accountancy. When I got there, there was no accountancy, so I pitched my tent with Mathematics and later added Geography. It wasn’t an easy ride because I had to compete with younger students who had just finished Higher School Certificate in secondary schools. My standard wasn’t up to these younger ones. So, instead of spending three years, I spent four years graduating in 1964. This denied me the opportunity of becoming a pioneer graduate of UNN in 1963. Nevertheless, I was still a happy man as a second set of the school because it was a mission accomplished. I have always been a lucky man because in the face of adversity, God showed Himself mightily. I was already a married man when I went to UNN to pursue a degree. And while I was still thinking about finance, McJob Grammar School, a private school in Abeokuta sponsored me for three years. The brother of the proprietor taught at Epe Grammar School and he recommended me to his brother for sponsorship. It was a dream come through because at that age I could have easily bowed out. Again, when I looked through our town here (Ijebu-Imosan), we had no graduate. That was a challenge to aim higher. In the end I made it. It was like breaking the jinx and opened doors of opportunity for people. After me, another person went to the University of Ife, and it has never ended. I was celebrated as Imosan Descendant Union gave me a reception to celebrate my academic achievement. My childhood ambition was to do a professional course but didn’t have the opportunity to go to secondary school. As a teacher, I look forward to becoming a head teacher of a school. I became a head teacher but wasn’t satisfied and thought I could be a principal, which I couldn’t achieve due to a low qualification. But I achieved this after I became a graduate. After graduation, I went back to McJob Grammar School, Abeokuta in 1964 to fulfill my three year bond, which I completed in 1968. When the proprietor died, there was an opening for the position of principal. I qualified but in-house-politics denied me this opportunity. They brought in an outsider to head the school and I left. I went to Imeko in Egbado Division where I was made a principal of a school owned by Prophet Muri. The school was not popular, had 43 students and it wasn’t approved. I took the advantage of my contact having worked in Ilaro before. The people supported me and the school boomed. In fact, the school was approved in my fourth year, was given grants, which enabled us to recruit and pay teachers who were willing to stay there. In 1972, I was moved to Baptist Boys’ High School, Abeokuta as Vice-Principal. I only spent few months at BBHS because it was the year the school had the shortest academic term for a section. It was when schools changed from September to June. I was transferred to May Flower School; Ikenne as a Vice-Principal and the Founder, the late Dr. Tai Solarin was the principal. I only acted as a principal when he wrote an article on the then Head of State, Gen. Yakubu Gowon condemning the marriage and the spending of government on the wedding. Solarin was taken to Eleweran in Ibadan by the authority and was released towards the end of the term. In 1974 March, I was transferred to Aba Nla School in Oyo State where I was till the end of August in 1974 when I was moved to Ijaye High School as a principal this time. I made a mark in this school. In 1975/76, there was creation of states and they asked some of us if we were ready to stay. I made up my mind and left. I came back to May Flower in Ikenne as a principal. Again, I was transferred to Adeola Odutola College, Ijebu-Ode. I was settling down when I was moved to Ogbogbo Grammar School where I eventually retired in 1982. So it has been a long walk to achievements. And the lesson, I learnt from my life trajectory in life is that if you want to succeed in life, you have to be hardworking. After my retirement from teaching, I joined Dr. Tai Solarin in running his private hostel. Dr. Solarin had a private boarding house and because government cancelled boarding houses in all schools, he felt this arrangement wouldn’t be convenient for students who came from far places. He requested for my service to help supervise it. I was doing this till 2002 when I finally retired. Turning 90 is the gift of God because I did not envisage that I would celebrate 70. I celebrated my 70th birthday with fun fare and I thought that was the last I would do. I have my reasons. Life has not been pleasant to me because it was a lot of struggle passing through life from my primary school days up to the university level. And since I retired, I have not been active as I used to. So, I am forever grateful to my maker for preserving my life till this day. As I said earlier, I got married before I went to the university. And by His grace, I was able to concentrate on my studies and at the same time taking care of the home front. Although I would have loved to do more for my children, the meager salary wasn’t enough. I still tried my best. Today, all my children have made me proud. So looking back, it has been a life filled with challenges and at the end of the day, through the help of God, determination and hardwork; I have been able to overcome. God has been my guardian angel because without him I wouldn’t have survived it. If I die today, I will be a happy man.